In Part 2 we will discuss some of the tools that you must have if your goal is to achieve consistent and repeatable color. It will also introduce you to the color management pyramid, which will help you begin putting a process in place to get you on the road to good color. In Part 1 of this series I discussed color theory and defined some terms that would help you with some of the fundamentals of color management. If you recall the red sports car example from Part 1, you would agree that you would never use a tire iron to change a spark plug. And yet, for many shops, not only are the basics of color misunderstood, but it's likely that there aren't any tools (much less the wrong tools) in their color toolbox. Our eyes can, and do, play a role in color management - just not an objective, repeatable role. So if you are looking at two colors side-by-side to see if they match, there is a good chance you will be able to make that determination. But, there are just too many variables when it comes to color, which makes relying on our eyes a poor choice for our color management toolbox. It is important to understand the industry standards that I'll be referring to as we look at the different devices. One of the organizations that are responsible for a number of the standards referenced in this series of articles is the International Organization of Standardization, or ISO. The ISO is an independent, non-governmental, international organization, the members of which bring together experts to develop voluntary, consensus-based, market-relevant International Standards. ISO 13655:2009 establishes procedures for the measurement and colorimetrical computations appropriate to objects that reflect, transmit, or self-illuminate. It also establishes procedures for computation of colorimetric parameters for graphic arts images. You can imagine that this standard will be referenced frequently as we look at the different Spectrophotometer devices. In this standard (ISO 13655:2009) are specifications for four measurement conditions. M0, M1, M2 and M3, and it's important to understand the differences and to make sure that whatever device you select supports the measurement condition you will want to use for your application. M2 is useful when measuring non-fluorescing inks independent of the effects of optical brighteners in the paper. If a paper contains no optical brightening agents, then the measuring conditions of M0 and M2 would be similar, if not the same. M3 mandates that the measurement condition must be void of UV energy, so in effect, M3 is M2 plus a polarization filter. For the sake of this article, I've selected spectrophotometers by X-Rite* and Barbieri* as they are the most popular and well known in the specialty graphic arena. Let's start by looking at the X-Rite i1 Pro2 device and its hardware specifications. The i1 Pro2 device is 155 x 66 x 67 mm (LxWxH). The i1 Pro operates in the spectral range of 380-730 nm in 10 nm steps. The optics of the i1 Pro uses a 4.5 mm (0.18 inch) diameter aperture for measurement. The light source is a gas-filled tungsten bulb (illuminant type A) and also has a UV LED. M0, M1 and M2 are supported by this device. The i1 Pro2 also has the ability to measure ambient lighting. There are still a number of i1 Pro devices out there, though you cannot purchase them new. If you have an old i1 Pro, just know that it is M0 and if ordered with a UV cut filter can also be M2 - but it is only one or the other. If you anticipate doing a great deal of profiling or linearization - and I hope you do - then you might want to look at the X-Rite i1iO Automated Scanning Table. The i1 Pro2 device will fit into the robotic arm, which will take a lot of the work out of repetitive reading of strips of patches. It is fair to say that the i1 Pro and now the Pro2 are devices that have served the industry well for a number of years and continue to serve the industry as an objective way to measure color. The new i1 Pro2 equipped with the different measuring conditions can be a great addition to your color management process. I also think it is fair to say that your application will drive the decision whether this device will serve your needs. Specifically, the 4.5 mm aperture is on the smaller side for those doing fabric or textile printing. Those applications will typically require a device with a larger aperture and the X-Rite eXact(tm) or the Barbieri SpectroPad or Spectro LFP will do a better job in those applications. To round out the X-Rite family let's take a look at the X-Rite eXact first. The eXact has the option of four different aperture sizes (1.5, 2, 4 or 6 mm and they need to be specified upon purchase) and measures in the 400-700 nm range. The eXact has the same measurement conditions of the i1 Pro (M0, M1 and M2) and it adds M3. 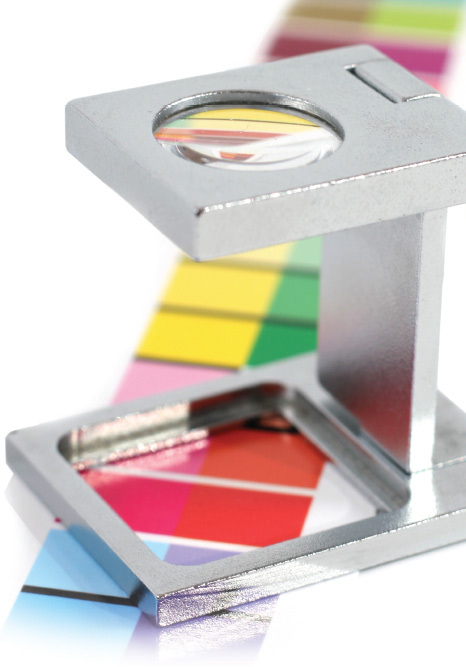 The eXact has embedded Pantone libraries and can transmit both density and spectral data. The eXact also has a scan option to scan a variety of strips from 5 cm/2 inches to 35.5 cm/14 inches in length. The eXact can operate tethered to the computer via USB or wirelessly using the eXact Manager software. X-Rite also has a number of other software options that will work with the eXact device. The Barbieri SpectroPad is 210 x 220 x 90 mm (LxWxH) and has a 6 mm aperture, which makes it a good choice for fabric or textile scanning. The Barbieri measures in the 380 to 750 nm range and it comes with a laser pointer to help with guiding the device when you are reading a strip of patches. The SpectroPad has a nice feature of a built-in humidity and temperature sensor. The Barbieri SpectroPad can operate tethered to a computer via USB or can wirelessly transmit data through its DOC Gateway software. For illumination it uses 7 LED-chips with D50 illumination in a 3-point circumferential arrangement (see M0, M1 and M2 are all supported. 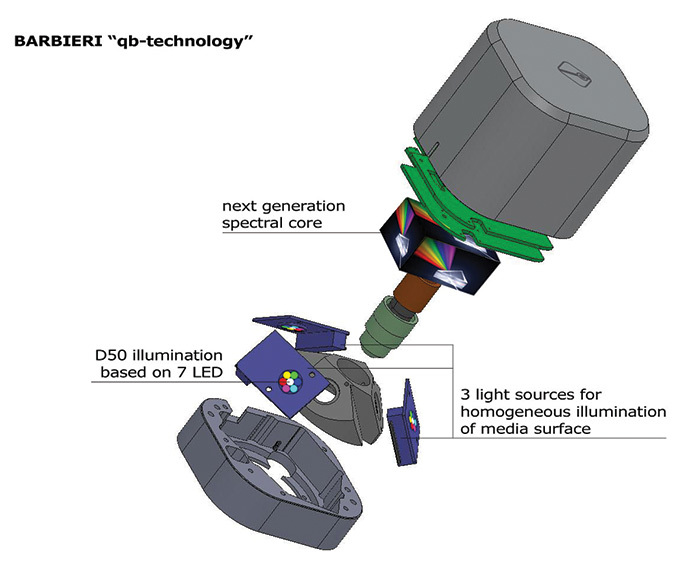 The Barbieri Spectro LFP is equipped with a 2, 6, or 8 mm switchable aperture (it is the only one of the devices described here that come with this feature). It is a device designed to automatically measure many different materials in large format, flatbed and industrial printing. The Spectro LFP also has the ability to measure both transparent and reflective media. The Spectro LFP supports M0, M2, and M3 measurement conditions. One last point to mention about the different spectrophotometer devices is the measurement geometry, which refers to the placement of the light source and the measurement angle between the light source and the sensor. The ISO standard is 0°:45°a, 0°:45°c, 45°a:0°, and finally 45°c:0°. The a stands for annular (a reflector from a light source that creates the circle of illumination) and the c stands for circumferential (consisting of overlapping light sources around the edge of the circle to get a uniform illumination at the plane. If you think about looking at a glossy piece of paper - think about the angle you need to look at it to avoid the "glare" from the glossy surface. That's a bit of an oversimplification of what is going on here, but I think it helps to illustrate this process. These devices use these circumferential layouts or the annular illumination so that the color you are trying to read is not obscured by a ridge or high point in the media (think of a canvas or a textile particularly). The SpectroPad uses a circumferential layout and the eXact uses an annular ring illumination layout. Again, your application will determine which device works best and it would be good to have the conversation with the manufacturer before purchasing a device so that you get the device that will best support your applications. Another tool to help with managing color in your shop is a light box (desktop or free-standing unit) or light wall that meets the ISO 3664:2009 graphic technology and photography viewing conditions. This standard defines the minimum criteria that all viewing systems need to meet. The standard is used to reduce communication errors between you and your end-user when viewing images for color reproduction. Color quality, light intensity and evenness of the light across the image, assures that the image color will be correctly interpreted. Lastly, the ISO standard defines the surround and geometry necessary to avoid impacting the hue and brightness and to minimize glare. GTI Graphic Technology Inc.* and JUST Normlicht* are two SGIA member companies that have a wide variety of solutions in this arena from desktop viewing stations, to full-size light booths, all the way to wall illumination systems. The number of devices are too numerous to cover in any detail in this article, however, the important point to remember - no matter what device you are considering - is to make sure that your device or system is compliant with ISO 3664:2009. And when talking about tools, software - specifically raster image processor (RIP) software - is a critical tool in the equation and one that is often overlooked. And by overlooked, I mean not having an understanding of how it works, how its defaults are set, and how it manages color from your input files. In Part 1 of this series, I talked about rendering intent and how important it is to understand the different intents (Saturation, Perceptual and Colorimetric). Equally important, however, is knowing where they live in your RIP software - usually somewhere labeled "color management." They really do want you to find it and adjust for your application! Lastly for RIP software, you need to have an input target (and again know where this is located) so that your RIP and the settings you choose will give you the most and best color you can output from your device. While on the topic of software, there are plenty of choices out there that will help you graph and plot linearization results, and some that will allow you to generate curves to put into your RIP software. Others will help you measure, analyze and even verify your color. I don't mean to be vague here, but an entire article could be devoted just to the software that is out there - and as soon as it was finished, some of it would already be out of date. But for some examples: Check out BabelColor, Chromix Color Think Pro, ChromaChecker, or even Color*Metrix. I'm going to wrap up this article with a quick introduction to the color management pyramid (see Figure 2, pg.59) - we'll dive in much deeper in Part 3 of this series. I mentioned in Part 1 the benefit and really the absolute necessity to have a process in place that you and your employees are following as it relates to color management. The color management pyramid can be the start of this process for you. I first learned about this process a number of years ago and have had great success helping numerous shops establish a process for managing their color. The color management pyramid is similar to the 4 Cs of Color Management, which are: "Consistency," "Calibration," "Characterization" and "Conversion." 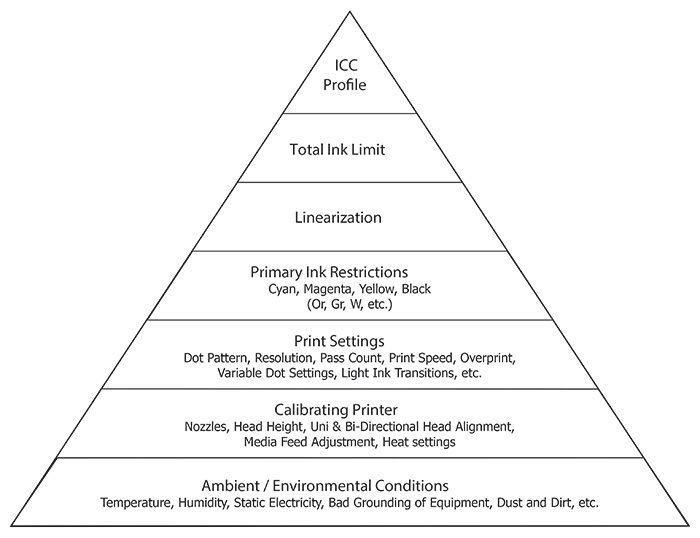 In the color management pyramid you start at the base of the pyramid with "Ambient" or "Environmental Conditions." From there you move up to "Calibrating the Printer." Next up is "Print Settings" and then "Primary Ink Restrictions" (these first four steps compose the "Consistency" step of the 4 Cs). Next on the Pyramid is "Linearization," which equates to "Calibration" from the 4 Cs. After "Linearization" is "Total Ink Limits" or in some places it is referred to as "Total Area Control." At the top of the Pyramid is the "ICC Profile" (this would be the "Characterization" step of the 4 Cs). For those of you who noticed that I only defined 3 of the 4 Cs, the last C is for "Conversion" - this process is managed in your RIP software with the input and output targets and rendering intents. So there you have it - tools that you will need and the structure of a process. Combining the tools with a process that you follow will put you much further down the road of consistent and repeatable color. In Part 3 of this series, we'll dive into the color management pyramid and dissect each of the layers so that you have a good understanding of the process and can implement it at your shop. This article appeared in the SGIA Journal, May / June 2016 Issue and is reprinted with permission. Copyright 2016 Specialty Graphic Imaging Association (www.sgia.org). All Rights Reserved.